The Middle East Forum is pleased to welcome Michael J. Totten as its newest writing fellow. Mr. Totten spent more than a decade in the greater Middle East as a foreign correspondent and is a contributing editor at World Affairs, The Tower, and City Journal. His first of seven books, The Road to Fatima Gate, won the Washington Institute Book Prize in 2011. His work has appeared in the New York Times, the Wall Street Journal, the Atlantic and numerous other publications. 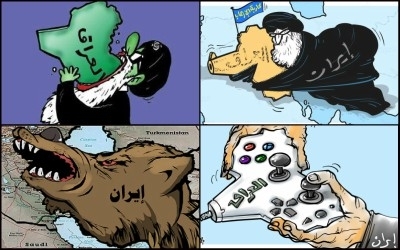 Arab cartoonists aren't optimistic about Iran's expanding footprint in Iraq. After a brutal nine-month war, the Iraqi Army has liberated Mosul from ISIS. The city, Iraq's second largest, is all but destroyed. The butcher's bill tallies 30,000 people dead and counting. Another 600,000, roughly a third of the population, have been displaced. Roughly three-fourths of Mosul's buildings are in ruins, two-thirds of its electrical grid is shredded, and much of what's left of the water system is booby-trapped. The price tag for reconstruction will be tens of billions of dollars that Iraq doesn't have. Anyone with sufficient weapons and training can kill terrorists, and it's much harder to rebuild a city than level it. Harder still in a fractious sectarian place like Iraq is establishing enough political trust and goodwill that hardly anyone will be interested in picking up a rifle and shooting at the neighbors again. It's not an impossible task, but if past behavior best predicts future behavior, what has happened during the last couple of years in Saddam Hussein's hometown isn't encouraging. ISIS fighters conquered Tikrit, 87 miles northwest of Baghdad and home to roughly 160,000 people, in June of 2014. They began their reign of terror the very next day by executing more than 1,500 Iraqi Air Force recruits and burying them in mass graves. They captured the whole thing on video and uploaded it to the Internet. The Iraqi Army didn't take back the city until the following March and was only able to do so with help from Shia militias backed by Iran. The vast majority of Tikrit's population have long been Sunni Arabs. Few were happy to see Iranian proxies show up with guns. And according to a recent piece by Ghazwan Hassan al-Jibouri in the Iraqi magazine Niqash, many of the Shia militants who drove ISIS out of the city stayed behind and have transformed the area's demographics. 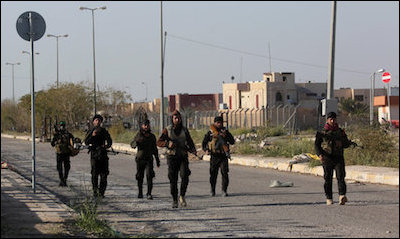 Members of the Iraqi Shia Imam Ali Brigades patrol outside Tikrit university in March 2015. For the first time ever, Shia mosques operate inside the city. Shia slogans appear on posters and are spray-painted on walls. You can now hear martial Shia religious music on the streets. "We proudly entered Tikrit and Al Ojah and we will arrive in Fallujah soon," go some of the lyrics. Many of the Sunni locals are afraid. They have their reasons. While Sunni Arabs make up the overwhelming majority in Tikrit, Shias make up the overwhelming majority in Iraq. Sunni Arabs are barely 15 percent of the country's population, only slightly larger in percentage than the black population in the United States. And since the fall of Saddam Hussein's (Sunni) Baath Party regime, Iraqi Shias, through sheer demographic weight, have dominated the government in Baghdad. 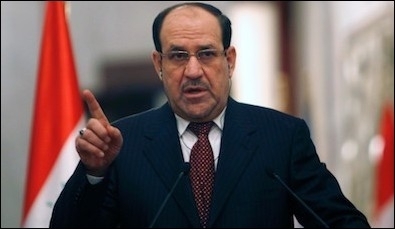 The previous prime minster Nouri al-Maliki ruled the country like an Iran-backed Shia warlord and used the power of the state to exact revenge against the Sunni minority. ISIS never would have found enough local supporters to conquer even a single neighborhood otherwise. Sunni Arabs didn't welcome or tolerate ISIS because they yearn for religious totalitarianism. The vast majority despise it and fought ISIS before under its previous name, Al Qaeda in Iraq. Rather, many in the Sunni Arab minority backed ISIS because they saw Abu Bakr al-Baghdadi's black-clad army as the only line of defense against a repressive sectarian regime in Baghdad with Tehran's money and weapons behind it. Iraq's previous prime minster, Nouri al-Maliki, ruled like an Iran-backed Shia warlord and used the power of the state to exact revenge against the country's Sunni minority. Too many Iraqis from both sects, alas, are not nearly liberal and tolerant enough to live adjacent to people they've hated and been at war with for more than 1,000 years—especially not after the recent bouts of sectarian "cleansing" in Baghdad after Saddam's regime was demolished. Iraq is not an organic nation-state. It wouldn't even exist in its current shape if it hadn't been artificially created by European imperialists in the early 20th century. Ideally, it would be split into three separate states—Sunni, Shia, and Kurdish. They might be able to live peaceably next to each other if each ethno-religious group were sovereign in its own domain. Carving Iraq into three, however, could only be accomplished by yet another terrible war with massive sectarian cleansing. Don't rule it out. Thorough sectarian cleansing has been underway in next-door Syria for years now. The Syrian and Iranian governments have forcibly relocated huge numbers of Sunnis from in and around Damascus in order to create what some call a "Shia crescent" running through Tehran, Baghdad, Damascus, and Beirut, stretching all the way from the Iranian capital to the Lebanese-Israeli border. Now that Mosul is already almost half-empty, and Baghdad—no doubt with Tehran's assistance—is poised to rebuild it, the Shia powers-that-be in the region have a fresh opportunity to add another major city to their necklace of pearls. They would be well advised to leave the Sunnis alone and let them go their separate way for a couple of decades. Instead, they've been doing the opposite.